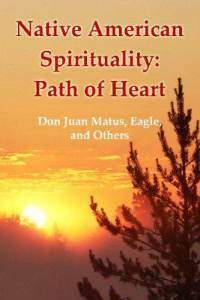 Native American Spirituality: Path of Heart Don Juan Matus, Eagle, and Others is an overview by Russian author Vladimir Antonov of native american spirituality as described in primary sources from brujos, shamans and medicine men like Silvio Manuel, Juanito, Eagle, Eaglestform, Don Genaro and Don Juan Matus from the Toltec traditions. Most importantly Vladimir Antonov outlines the overall spiritual approach of the Native Americans paths in a universal spiritual context. He, for example, compares the Toltec descriptions of the energy body with the Asian chakra-systems. An overview of native american spirituality as described in primary sources from brujos, shamans and medicine men like Silvio Manuel, Juanito, Eagle, Eaglestform, Don Genaro and Don Juan Matus from the Toltec traditions.